In the British tabloid the Sun there's a prime example of a bunk and bogus reporting of a scientific study. The headline says, “Mind-reading machine can now translate your thoughts to text immediately by interpreting brain activity.” The text of the article is carefully worded to make you think that such a mind-reading machine was invented. Here, we introduce a real-time neural speech recognition (rtNSR) software package, which was used to classify spoken input from high-resolution electrocorticography signals in real-time. We tested the system with two human subjects implanted with electrode arrays over the lateral brain surface. Subjects listened to multiple repetitions of ten sentences, and rtNSR classified what was heard in real-time from neural activity patterns using direct sentence-level and HMM-based phoneme-level classification schemes. Main results. We observed single-trial sentence classification accuracies of 90% or higher for each subject with less than 7 minutes of training data. This isn't mind-reading at all. It's auditory perception classification, and to only a very limited extent. Two people listened to the same ten sentences being spoken over and over again, while their heads were hooked up to equipment that monitored electrical signals from their brain. Some software used these readings to make guesses about which of these ten sentences were later spoken to the people. This type of guessing is not any type of thought reading. Something that you are hearing is not something that you are thinking. When you hear something, that's a perception, not a thought. The Sun news story has a phony-baloney infographic telling us that in this experiment “thoughts appear on screen as words,” but no such thing actually occurred. The story has been repeated, with similar inaccuracies, by other sources such as the Daily Mail. What we have here is a stunt of no obvious usefulness. It's hard to foresee how anything useful might come out of being able to predict which sentence a person is listening to by reading traces of auditory perception in his mind. The study raises ethical concerns. Did Moses and his team implant electrodes in two people's brains (presumably something that might risk brain damage) to achieve this unimportant result? A similar bunk story appeared in 2016, with the headline “Scientists Have Invented a Mind-Reading Machine That Visualizes Your Thoughts.” The actual activity was based on analyzing brain activity during visual perceptions, and did not involve any actual reading of thoughts (although it may have exploited perceptual after-images, as discussed below). A 60 Minutes segment on an alleged "mind-reading machine" is preserved on a youtube.com video entitled “Mind Reading Machine on CBS Reads Your Thoughts.” But it isn't a reading of thoughts. The video shows people hooked up to a brain scanner. The people are shown viewing pictures of one of ten different objects, The machine then predicts from patterns in their visual cortex which of the ten things they were looking at. This is perception prediction, not a reading of thoughts. In some of these experiments, the experimenters may be exploiting a kind of brief after-effect where traces of something you just saw linger for a few seconds in the visual cortex. Imagine if I hook someone up to a brain scanner, and show them a picture of a wrench for five seconds, and then ask them to close their eyes for five seconds and think of what he just saw. It is entirely possible that the parts of the visual cortex activated by such a perception will show traces that linger for a few seconds. We seem to see this in after-image optical illusions. An example of one is below. 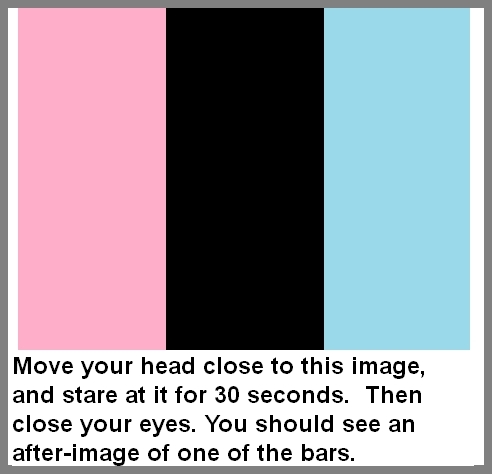 If you look at this image for 30 seconds, and then close your eyes, you should be able to still see one of the bars for a few seconds, as a kind of ghostly bar in your mind's eye. You can find many other examples of after-image optical illusions by doing a Google image search for "afterimage." We can imagine how an experimenter might exploit such an effect. He might hook a subject up to a brain scanner, and ask the subject to stare at an image for 30 seconds, and then close his eyes and think about the image just seen. The brain scanner might then scan the person's brain for a few seconds, and be able to predict which of 7 images the person saw, based on what was seen in the brain when the subject's eyes were closed. The experimenter might then encourage people to think such a thing was mind-reading. But this is not thought-reading. The scanner is just picking up a perceptual after-image. This is probably what is going on in the 60 Minutes video. If an experiment like the phony description in the Sun story had actually occurred, it would be a monumental breakthrough of the greatest interest to every philosopher of mind. It would tell us that thoughts are actually generated by brains, an idea which has never been proven. There are good reasons for doubting such an idea. Among these are the fact that we have no understanding at all of how a brain could generate a thought or an abstract idea. As discussed here, attempts to search for a neuroscience explanation for how a brain could generate a thought results in a spectrum of incoherence that doesn't add up to anything. Thoughts are mental things, so how could they possibly be generated by merely physical things like brains? That would be rather like blood pouring out of a stone. Other very dubious stories in the press include one that memory can be enhanced by electrical stimulation. One headline says, “Electric pulses to the brain can improve memory as much as 15 per cent, finds study.” Such a result is unimpressive. An experimenter could show a 15 percent increase in memory retention when people held a rabbit's foot in their hands. The experimenter need merely try 20 or 30 tests, and then submit for publication whichever one produced the best performance, taking advantage of random variations. There is no such thing as a pure memory test, since every memory test is a test of perception, concentration, and memory. It is easy to imagine how some meaningless brain stimulus might cause someone to do a little better in a memory test. Suppose you do an experiment in which you first have a subject try to memorize things under normal conditions, and then have the subject try to memorize things while some fancy brain gizmo is attached to his head. Let's imagine the brain gizmo doesn't actually do anything except give the reader a little buzzing effect. It's entirely possible that this will produce a 10 percent or 15 percent performance improvement that is purely the result of a kind of power of suggestion and expectation. The subject may kind of have the feeling that when he's wearing the brain gizmo, this is when he is expected to perform really well; so he may simply concentrate a little harder while wearing the brain gizmo. A minor difference in concentration could easily account for a 15 percent difference in performance. It is also possible that such a minor difference in performance is simply a result of a kind of placebo effect. The power of the placebo effect is well documented. If a doctor in a white coat gives a man some sugar pill, and tells him this is a powerful cure for his ailment, the patient will very often report that the pill was effective. We don't understand why this happens again and again, and it may be a mysterious type of mind over matter. It is easily possible that such a placebo effect can also come into play in a memory test. Hook someone up to some fancy brain gizmo and test his memory, and he may perform a little better. The result may have nothing to do with the gizmo, but may be simply the person performing a little better because he believed something had been done to make him perform better, with the result being a kind of placebo effect. One recent experiment (dubiously billed as a test of a "memory prosthesis") involved 22 patients with brain electrodes who 100 times chose a particular visual image from a group of images. The brain electrodes recorded electrical activity in the hippocampus during this training. Then some of these signals were played back in a later test in which patients had to pick the original image from a set of 3. This reportedly producing a 40% increase in "memory recall" involving that particular image. But it is known that the hippocampus has a role in visual perception, as this long scientific paper tells us. So what could have been going on here is that some of the visual perception mechanism of the brain was captured and replayed. Such a result can be explained without any assumption that anything is going on involving memory. We could have a bit of "perception playback" rather than enhanced memory recall. I can imagine a type of experiment which to the best of my knowledge has never succeeded. A person would be hooked up to a brain scanner, and would then try to concentrate very hard on one of 7 things which he had not recently seen, such as an apple, a banana, a blue ring, and so forth. Software connected to the scanner would then try and guess which of the things the person was thinking about. If the prediction was successful, would this prove that the brain is generating such ideas? Not at all. It would merely suggest that the visual cortex used by the brain in vision can be leveraged when someone is trying hard to visualize something. A mind's eye image of something is not necessarily the idea of a thing. You may first have the idea of Marilyn Monroe in a bikini, and then concentrate hard to kind of visualize that, fleshing out some details (such as imagining a particular bikini color). If we use a little of the visual cortex when making a vivid visualization in our minds, that does not prove the preceding idea came from our brains. The tabloid Daily Mail has a story about a "mind-reading headset" that has "90 percent accuracy." It has nothing to do with the brain, however. It turns out that if you try hard to speak a word in your mind, so you "can hear it loudly" in your mind's ear, you usually inadvertently use a little muscle to do that. You can prove this by trying to "silently shout" the word "banana" in your mind while holding your neck -- you should feel a little muscle movement. So the "mind-reading headset" is merely working off such a thing. And the "90% accuracy" is only for a few words that it's been trained on. This tells us nothing about whether your thoughts originate from your brain or something non-neural like a soul. You will no doubt continue to see quite a few "mind-reading machine" stories in the news, even though no one will actually create such machines. The rule on the web these days is "clicks=cash." The more you click on a link to sensational-sounding science stories, the more advertising revenue the web site makes from ads on the site. With such a situation, there is a great incentive for careless exaggeration of science and technology developments.